Baby jumpers are just as much for parents as they are for babies. Your baby will love the activity and stimulating toys. You’ll love knowing that he’s safe, happy, and contained. To help you find the best baby jumpers, we’ve researched some of the most popular products out there. Well, our babies did. We played and giggled for hours to bring you the top 10 baby jumpers. Before we “jump” right in, let’s take a look at the features you need to know. Age Range: The most important thing to keep in mind is that your baby needs to be able to hold his head up well before using one of these. After that, he’s good to use it until he starts to walk. Toys & Activities: Each of our top picks has different kinds of toys, music, and activities to keep your baby entertained. That’s not all - they’re also designed to stimulate both physical and cognitive development. Your baby will get smarter just by playing! Type: Stand-Alone baby jumpers tend to have a lot more cool features. But if you don’t have room or just want something that takes up less space, a doorway jumper is definitely the way to go. Dimensions: You’ll see a lot of variation here. Stand-Alone jumpers have a much larger footprint since they sit on the floor. Doorway jumpers hang and so are much taller but don’t take up much floor space. Warranty: Warranties are always important, especially when it comes to baby stuff. Most of our top picks come with a 1 year warranty, though there are some that offer only 90 days. Make sure you know what’s covered. And what isn’t. Made In: All of our top picks are made either right here in the USA or in China. These brands have all been around for a long time and are dedicated to making high quality products for your little one. Now that you know what to look for when finding the right baby jumper for your little peanut, let’s get right to the reviews. We’ll leap right into the reviews, if you will. (We’re sorry, we can’t help ourselves when there are so many obvious puns to make.) Here, you’ll find our top 10 baby jumper reviews. If you’re in a hurry, make sure to take a look at our top and budget picks first. Ok, let’s get right to it! Our top pick is the Evenflo Jungle Quest jumper and once you take a closer look at it, you’ll understand why. First of all, it has an adorable jungle theme complete with zebra print accents and friendly animal toys. Evenflo actually worked with the Child Development Institute to develop age-appropriate toys to help your baby learn and grow mentally. That’s not all. 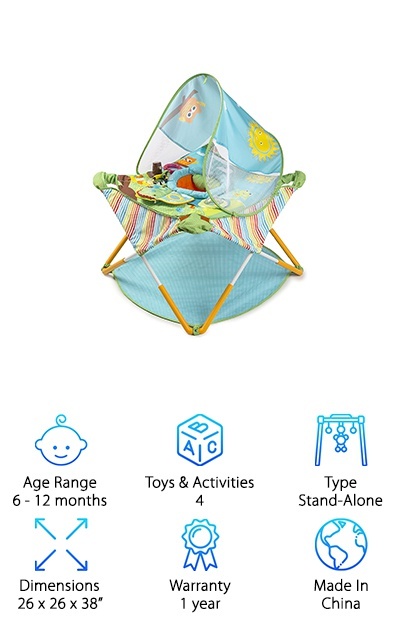 This baby jumper not only allows for jumping but also provides a spinning action. This will help your child develop gross motor skills and build core strength. You can also adjust the jumper to 3 different heights so it can grow as your child does. 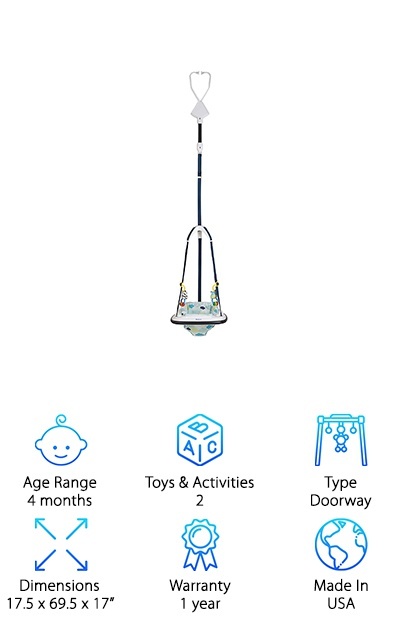 It’s convenient, too, because you just quickly remove the seat cover and throw it in the wash.
Not only is this best baby door jumper convenient for small spaces, it also has a lot of essential features at an affordable price. If you’re a parent, you know how important is it that your kid’s toys are washable. This jumper has a high-back supportive seat with a removable cover that can be thrown right in the washing machine. What sets this doorway jumper apart? The non-twist straps make it so easy to get your baby in and out! The clamp is designed so that it won’t leave a mark on your doorframe or wall. It’s spring loaded and attaches just about anywhere. 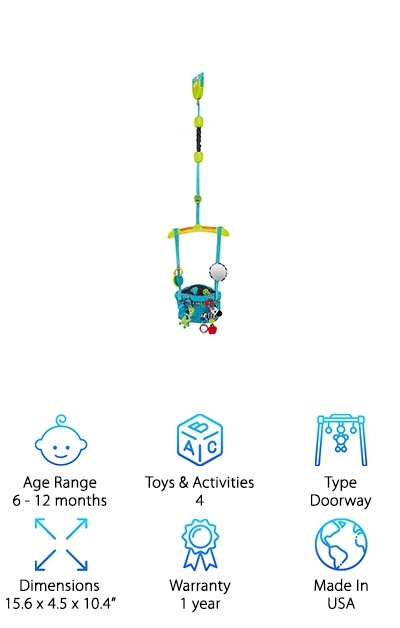 Plus, you get a built-in toy tray and two soft, removable toys with adjustable play rings. If you’re keeping your eye out for the best jumper for baby that’s really comfortable, you’re in luck! The Bright Starts Bounce ‘N Spring is an excellent choice. For starters, it had a padded seating ring to keep your baby’s bottom comfortable. Plus, the high-back seat has a pillow for added cushioning. That’s not all. To make sure your baby can use this jumper until she’s 1-year old, a simple strap adjustment allows you to easily adjust the height. This doorway jumper also includes a sturdy clamp to help it fit securely in any doorway. You get a nice variety of toys with this one, too, including 2 plush toys, a mirror, leaf teether, and rings so you can attach some of your own. For a jumper with a familiar face, you can’t go wrong with the Disney Finding Nemo Jumper. With 13 toys, your baby will see lights, hear soothing melodies, and interact with adorable baby Nemo and his friends. In addition to Nemo, you’ll get a Bruce the shark ratchet toy, a light up musical Squirt, as well as appearances from Mr. Ray and, of course, Dory. But you get more than just cute characters! The seat has a high back the provides extra support for your baby and spins 360 degrees. This jumper will also grow with your baby thanks to the 4 different height adjustments. The characters will remind parents of their own childhood, helping you and your baby build a stronger bond. 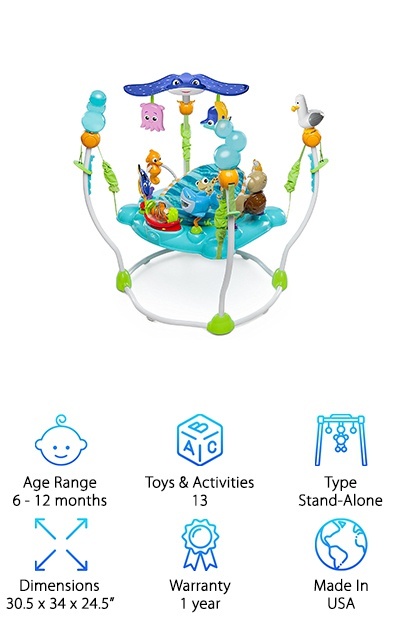 Baby Einstein is well known for their fun and mentally stimulating toys this best baby jumper activity center lives up to high standards of their brand. This ocean themed jumper truly has it all. For your little one, you’ll find calming ocean sounds and familiar classical melodies. Not to mention the piano station with a language discovery mode that introduces your baby to English, French, and Spanish. There’s also a leaf teether and friendly, playful sea creature toys. Parents will love the educational content and that it’s compact with an adjustable height. 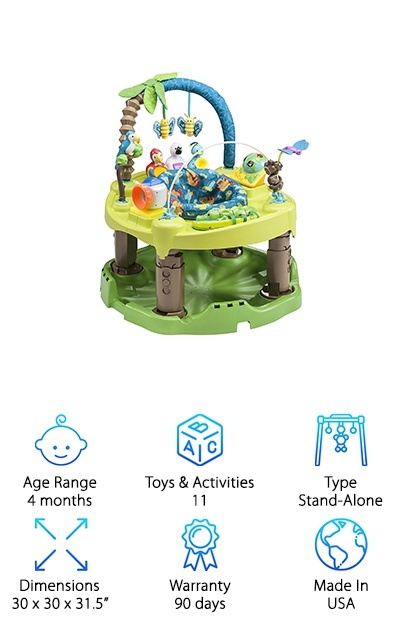 You even get link loops to add some of your baby’s favorite toys if you want to! Plus, you can control the volume. Trust us. Volume control is something you want on a baby toy. Something really cool about this jumper is the overhead canopy. Two soft leaves extend from the top of the frame over your baby’s head. A parrot and a tree frog hang from the leaves, giving your baby a chance to stretch his arms and bat at things overhead. There’s a 3-position height adjustment so this one can grow with your baby. 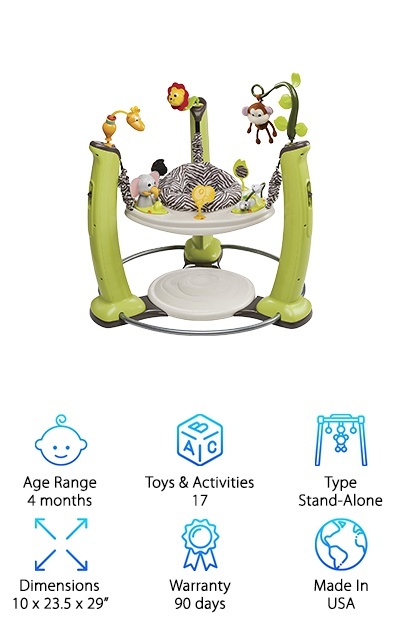 The seat rotates a full 360 degrees so your little one can enjoy 5 different play stations, all with cute rainforest animals like a monkey, tiger, and lizard. There’s lots for mom and dad to love, too. Because it’s so easy to put up and take down, this baby jumper is portable and easy to store when not in use. What is so great about this jumper from Summer Infant is how easily it goes from inside to outdoors. First, it’s really portable. It’s lightweight and folds up almost like an umbrella. Then just slip it in its carrying bag and you’re ready to take it to the backyard, beach, or the park. There’s a soft cloth surface underneath for baby’s feet to stand on so you don’t need to worry about grass or dirt. Plus, the overhead canopy protects your little one from harmful UV rays while she’s too young to use sunscreen. Of course, there’s plenty of things for your baby to love about this jumper, too! We think she’ll especially love being able to safely play in her jumper while outside in the fresh air. We can’t get over how adorable the fabric is on this Graco Stratus Bumper Jumper. The white background with blue and green clouds in different sizes and patterns is perfect for your little girl or boy. It’s really easy to move from room to room, too, because it’s so lightweight. It only weighs 4.1 pounds! That’s not all. Despite being lightweight, it’s also really sturdy and can hold your little one until she weighs 25 pounds. It’s easy to adjust the height on it, too, so you can keep up with your baby’s growth. The high-backed seat can easily be wiped down or removed and thrown in the washing machine, perfect for coping with any of those unexpected messes. This one is really awesome and is hands down the best baby activity jumper. And not only in height. 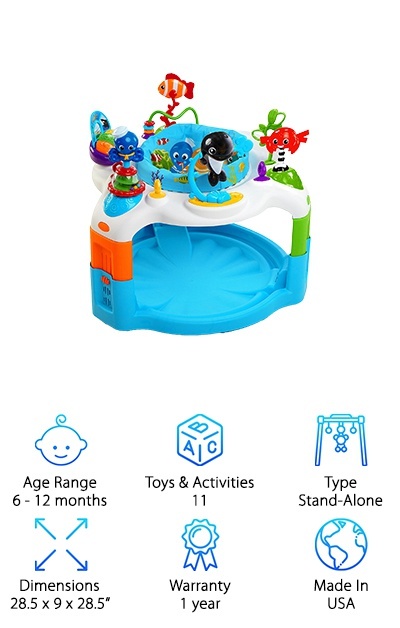 This is actually a playmat, exersaucer, and activity table in one. What does that mean? This isn’t just a jumper. You’ll be using this one for a long time. The cute amazon themed toys and fabrics make every part of this one adorable. When they’re brand new, your baby will love the play mat. 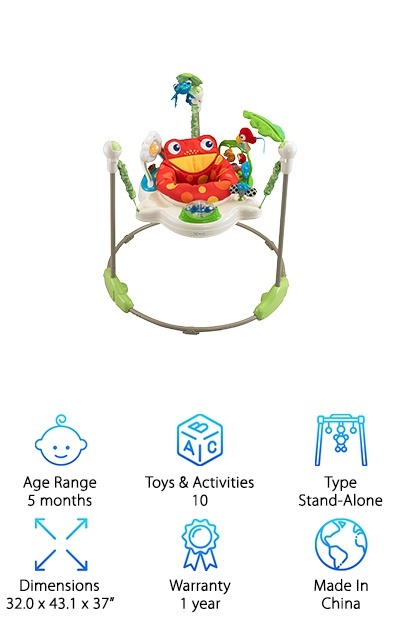 As they get a little older, the exersaucer offers 11 age-appropriate toys and music. The seat pad is machine washable and the whole thing collapses for easy travel and storage. It also has a 3-position height adjustment but don’t worry. When you little one does outgrow it, it transforms into an activity table for even more fun. Take your baby on an underwater adventure with this door jumper from Baby Einstein. They’ll jump and giggle while playing with the 4 age-appropriate toys: a mirror, starfish teether, rattle, and crinkly fabric cards that feature underwater animals. And that’s not all - it also gives the English, Spanish, and French name for each animal! The straps are easy to adjust and the frame is lightweight and easy to transport or store. The door frame clamp is strong and durable, too. Plus, the padded seat is machine washable so you can easily take care of any messes. Another great thing about the seat is that it’s supportive. The high back gives you baby just the right amount of support to jump his little heart out.